It’s totally understandable for Kildare fans to sit on the fence a while. “Sure, that’s the worst team ever to play for [insert opposition]”. “Let’s see what they do against [insert oppostion]”. Totally understandable. We’ve been let down more times than I care to remember and some that my memory refuses to recall after 40-odd years of it. The details of this game shouldn’t live long in the memory. Deprived of two more corner forwards (Neil Flynn and Chris Healy) to add to Ben McCormack’s absence, Cian O’Neill went for square pegs in round holes and push as they might they couldn’t squeeze through in an awful first half. Down might truly be the worst team ever to represent their county (see above), buoyed as they were by two wins out of nowhere coming into this one. Once Kildare found a way to unpick the lock on the massed defence in front of them, they found yet another goalscoring forward off the bench in David Slattery. O’Neill admitted his mistake in hauling Cathal McNally ashore from his slip-sliding misery at half time and within 90 seconds Slattery had kept his balance to snaffle the game-defining goal. A deftly-taken second in the 49th minute from the Confey man saw Kildare home and hosed. From there to the end Kildare’s “game-management” – a phrase never used in connection with a Lilywhite football team before I’d venture – was superb. It showed a growing maturity as they held possession impressively, picking off points at regular enough intervals to keep Down at arms’ length, and gradually frustrated the life out of the mis-firing home team. Leaders are emerging in this Kildare side. The two most vocal and the clear organisers on the pitch are captain Eoin Doyle and the outstanding Athy midfielder Kevin Feely. The latter gave a masterclass in midfield play. Four marks taken against Down’s physical and experienced midfield duo of Aidan Carr and Peter Turley, constantly driving his team forward whether with fist passes or accurate foot passes, organising the players around him, Feely was everywhere. And for an added bonus, we need not have worried about the absence of regular free-taker Flynn. Feely was so accomplished in the role, kicking five points from either foot, missing just once and that from a long way out. He might keep the role as Flynn has been somewhat hot and cold on that front of late. Behind him, Doyle barked out orders and encouragement while doing his own sweeping up job impressively. Kildare meandered far too much playing with a heavy drizzle and gusting wind behind them in the first half and the crowd groaned more than once as a forward ran out of options and kicked diagonally back to a wing back minding his own business on the opposite side of the pitch. On one such occasion Doyle roared at the offending forward Paul Cribbin to “stay patient”. Sound words and good advice as Kildare clearly had the beating of Down if they kept their heads. Probing was the order of the day in that first half. As is their way, Down got 14 behind the ball leaving full forward Barry O’Hagan as the sole man up. But he was lively and looked to have too much pace for Dave Hyland early on as Down found him with regularity. He opened their account within 2 minutes before Kildare had scarcely handled the ball and added a second on 12 minutes. Hyland won his first ball on 14 minutes and got to grips after that. On occasions corner forward Ryan Johnston looked dangerous too and he could have goaled on 3 minutes when he slipped inside Ollie Lyons only for Mark Donnellan to spread himself and make his now customary one-on-one save. The excellent Lyons wouldn’t make another mistake all game. Donnellan had opened Kildare’s account with a fine kick from a ’45 on 5 minutes, and they levelled it with their only score from play in the first-half on 18 when Moolick was set up by yet another fine catch from Feely. It was pretty turgid stuff though with none of Kildare’s inside forward line of Conor Hartley, Daniel Flynn and McNally able to get on the ball. Underfoot conditions were undoubtedly a factor as well as Down’s swarm defence. 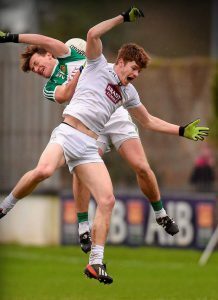 Gradually though Kildare’s possession began to tell and, with more than a little help from Fermanagh referee Niall Cullen, Feely slotted three frees to just one in return from Darragh O’Hanlon before the break. Down had gone 19 minutes without a score until that free. Cullen’s performance infuriated the home supporters and it was hard to argue with them. One final moment of note from that first half. With the scores at 0-4 to 0-3 (stellar stuff…), and entering one minute of injury time, Down gained possession in their half. O’Neill roared “everyone back” as Kildare seemed determined to go in leading at the break. Every Kildare player funnelled behind the ball Donegal-style and saw it out to the whistle. Game management. Kildare noticeably upped the ante on the restart. And finally they found some penetration. A delightful move down the right saw Flynn and Feely involved before Slattery was on hand to drill a low shot into the net. Daylight! Feely added another point before Down’s impressive left-half back Caolan Mooney struck two magnificent efforts between the posts to keep them within a goal of the visitors, although one of those was a shoddy affair from a Kildare perspective as they switched off for once at a free kick and allowed Mooney to waltz through. The hammer blow came on 49 minutes though. Niall Kelly, tightly marked once more (although he judged the referee well all day! ), played an insightful pass and Slattery, showing a real forward’s instinct, spun behind his marker and sidefooted the ball past Michael Cunningham for his second green flag. From here on the exchanges got somewhat feisty and Slattery shipped some heavy treatment, eventually necessitating his withdrawal, but he’ll remember his 30 minute contribution for a long time. Kevin McKernan, the evergreen Down wing forward, kicked a fine point and Darragh O’Hanlon, somewhat wayward earlier with his frees, found the range consistently to score three before the end. But Kildare played the possession game effectively. Feely kept the scoreboard moving with his fifth free and finally with 7 minutes to go a Kildare forward managed to raise a white flag as Cribbin capped another hugely energetic performance with a fine score. With four minutes left Flynn looked up to find Lyons galloping through the middle. It was nosebleed territory for the wee Celbridge man but he kept this nerve eschewing the temptation to go for glory and calmly chipped over the bar for Kildare’s last score. Injury-time was unfortunately aptly named for the Lilywhites as Doyle shipped a heavy blow and had to be helped gingerly from the field. A worrying sight to put a dampener on the day. Prayers will be said. In one final act a high ball rained in on Donnellan with an attacker looming. After Cork and Derry you willed him to punch and punch he did, clattering into the Down man for good measure. Lesson learned. Kildare are now just one win away from a return to Division One after a roller-coaster four years post Kieran McGeeney. A small word of warning though : Clare and Galway may just be their two toughest games yet. Fat ladies and all that. The team though looks unrecognisable a year into O’Neill’s reign, benefitting from a relatively small, stable squad with players growing more and more into their roles. It has to be remembered that Flynn, Cribbin and Mick O’Grady all missed large parts of last season while Feely was feeling his way back into the code and Doyle was edging back to full fitness. And with players like Lyons, Keith Cribbin, Johnny Byrne, Fergal Conway, Donnellan and Niall Kelly showing incremental improvement on prior years, the future is looking considerably brighter. When to believe? How about now? Kildare : Mark Donnellan (0-1, ’45); Mick O’Grady, David Hyland, Ollie Lyons (0-1); Johnny Byrne, Eoin Doyle, Keith Cribbin; Kevin Feely (0-5, 5f), Tommy Moolick (0-1); Fergal Conway, Niall Kelly, Paul Cribbin (0-1); Cathal McNally, Daniel Flynn, Conor Hartley. Subs: David Slattery (2-0, for McNally HT), Fionn Dowling (for Hartley 53), Eamon Callaghan (for Slattery 65), Eddie Heavey (for Moolick 67), Shea Ryan (for Conway 69), Liam Healy (for Doyle 70+5).